As the reorg of my craft cabin continues, I've still managed to do a bit of sewing. 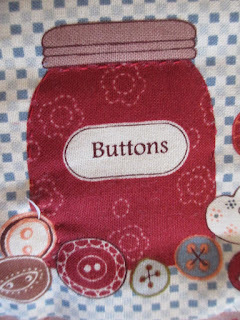 In January at the Make-It Show in Farnborough, I bought a panel for my sewing area. I wasn't sure if I would cut it up and make cushions or use the cut pieces as appliques for tote bags, etc. but in the end I decided to leave it whole and quilt it. Well, quilting is probably a rather loose term here, but that's what *I* would call it. First, I tacked on some wadding (UK)/batting (USA), then I machine stitched around each panel. So far, so good. Then I attached a solid colour piece as the back, but realized it would look much better if I stitched around some of the elements within the panels. Doh! Unless I took the back off, there was no way to do that. Instead I hand-stitched some of the bigger bits without catching the back. That was a little tricky and I soon decided I'd had enough of that, so not all of the panels have hand-stitching. 1) To make the sandwich first: panel, wadding, and a plain muslin or cotton backing. 2) Once the panel sandwich is done, THEN start stitching. Machine stitch as much as possible, then hand stitch. 3) Once ALL the stitching is done, then attach the back fabric. That way, the inside cotton/muslin holds it together better. It doesn't matter that stitching shows on this back as it will all be covered by the back fabric. So, I've managed to get rid of a lot of magazines but still have a few boxes of scrapbooking and card making stash to go, including lots of stamps. The problem is that my local craft friends have also gone away from scrapbooking and cardmaking to sewing, so no takers there! I need to have a garage sale, I think. I'm sure that as soon as do, however, I'll decide to scrapbook again. Meanwhile, I think I'd like to find a local quilting, applique, or patchwork class. I'm looking at the residence-type courses at Denman College (the Women's Institute college), but they're expensive. None of the local fabric shops (there are only a couple of them anyway) offer courses and I don't have the time to do the 10-week courses offered by the Kent County Council. Ah well....!